During the Mississippian Period there were settlements that ranged from small farmsteads to huge villages and ceremonial centers, and a population that now rivaled other places around the world. Agriculture was at its peak, with large scale cultivation of various crops now in practice. During this period, 900 AD to 1450 AD, the Mississippian people would produce an extensive collection of pottery, with design varying by region. During the Mississippian Period there were settlements that ranged from small farmsteads to huge villages and ceremonial centers, and a population that now rivaled other places around the world. Agriculture was at its peak, with the large scale cultivation of corn, beans, squash, and sunflowers along with other vegetables. Village centers had fortified walls for protection from raiding parties and some even had guard towers, such as the city Cahokia, located near St. Louis. Cahokia boasted a population exceeding 20,000 people and covered over 6 square miles. Although farming constituted a large portion of the food stores of the time, the hunting of deer, turkey, squirrel, and raccoon still played a vital role in the diet of the Mississippian people. Hunting was now being done with the bow and arrow as the weapon of choice. A fascinating traits of the Mississippian culture was the vast quantities of pottery produced during this time period. Using small bits of shell to temper, or strengthen, the clay used in their pottery, the Mississippian people became experts at making pots, bottles, plates, and jars from clay. The artistic design that went into decorating these pottery vessels varied by region, but nowhere had it surpassed the expert craftsmanship and artistic design that was found by the inhabitants that lived in the area now known as modern day Arkansas. The Arkansas area was occupied by three major groups during this period: the Caddo in the southwest, the Quapaw along the lower Arkansas River, and a group simply called the Mississippians in the northeast. Although this period started out as the high point of ancient civilizations in the Americas, it ended quickly with many of the Mississippian Period people being virtually eliminated by the diseases introduced in the European arrival. Mississippian Buffalo Fish Effigy Bottle, found at the Beck Site, Crittenden County, AR. Headpot depicting a distinguished elder. Found at the Campbell site, Pemiscott County, Missouri. Mississippian Head Pots are considered a pinnacle of the Mississippian culture and are among the most rare and unique clay vessels. Made between 1200 AD- 1500 AD, they are distinguished from other pots in that they are formed to the shape of a human head. Only around 140 of these effigy head vessels have been recovered. Head pots are often thought to be a representation of the dead, a death mask. These pots were often shown with painted surfaces and engraved lines depicting tattooing. There is evidence of ear and nose piercing being practiced with the head pots often depicting this with perforations. These vessels may have been adorned with feathers or other material before they were buried as an offering. The largest number of these rare pots has been found in southeast Missouri and Northeast Arkansas. Caddo pottery is usually found in the 4-corner area of Arkansas, Louisiana, Texas and Oklahoma. [Generally, Caddo pottery exhibited superior technical construction to most other Mississippian Era pottery.] In general, Caddo pottery is superior [another wording that sounds less ?] in technical construction to most other Mississippian Era pottery. It is usually thinner, more symmetrical, and smoother in its finish. The best artistic creations made were bottle forms that exhibit extensive engravings. To achieve the high black luster often seen in Caddo pottery, [typicalo of the type?] the artist used a fine coating called slip, a mixture of sifted fine clay and occasionally paint. After the slip, or paint, was applied, the artist would take a stone and rub it to achieve the desired high polish. Although effigies are rarely seen in Caddo pottery, the museum houses several rare instances of these uniquely rare vessels in animal and other effigy forms. Hodges engraved bottle with proturbant footing. Found by Cleatius Thomas in Hempstead County, Arkansas. Quapaw "double headed dog" effigy teapot, recovered from the Hudnall site, Lee County, Arkansas. Of any of the three pottery cultures, The Quapaw people had the shortest sojourn in the Arkansas area . The Quapaw appeared late in the period, around 1500 AD and lived in the area until historic times. The Quapaw culture is known for its beautiful painted vessels, utilizing the colors red, white, and black. 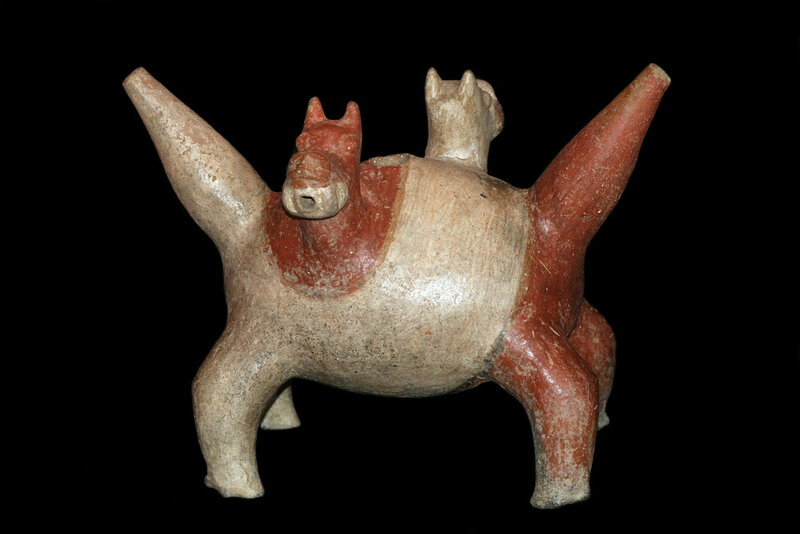 Pottery was often made in effigy form, depicting animals and items in striking detail and accuracy. These exotic effigies sometimes depict dogs, deer, otters, frog, shells and even people. Quapaw pottery is considered some of the most artistic and distinct pottery of North America.